I was excited to hear about this book and receive a copy of it but my feathers fell when I saw a quote by Edward Snowden on the dust jacket. The publisher also place Edward Snowden’s review at the top of the others in the pre-release reviewer’s list. This is not a book about Edward Snowden nor was he a hardware hacker, so I’m not sure what his “endorsement” does for the book except diminish its overall value to me. In fact, even if this book were a 10/10, which it isn’t, this inclusion decreases that review by at least two points right off the top. I was very disappointed to see any mention of Snowden in this book. 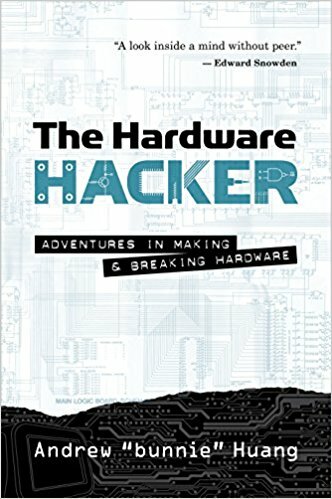 The Hardware Hacker is basically a reprint of Andrew Huang’s blog. Most of the information in the book is long outdated and is basically a memoir of stuff he’s done. If you’re looking for this book to actually teach you something, save your money. It’s basically one man’s adventure into various aspects of “hacking” and building things. At the end of the book, there’s a lot of info about DNA, which totally doesn’t fit with the rest of the book. As one Amazon.com reviewer put it, it’s navel-gazing. I’m sure there’s an audience for this book and it’s decently written, but it’s not a reference book by any stretch. If I had to categorize it, I’d call it technology historical nonfiction. I guess if you’re interested in “how one guy did it”, then this is a good book. Otherwise, save your money and wait until it’s on the penny list or bargain bin at used book stores. I’m not actually sure why No Starch wanted to publish this book and I’m hoping that they didn’t invest a lot of money in its production. It seems more like something that should have been self-published and sold on Huang’s blog site as an ebook for his followers. Originally, I was going to create a video review of this book but I just don’t see enough value in it to go to that much trouble. I am not really sure who the audience for this book is supposed to be. If you know who Andrew Huang is, then you’ve already seen this material, except perhaps for the weird DNA-related material. And if you’re like me and never heard of Andrew Huang, then this book is not likely to make you a fan. I’ve seen some laudatory reviews on Amazon and other sites but I don’t think they’re to be believed. Honest ones like the three-star Amazon review I referred to earlier is more realistic. I don’t mean any offense to No Starch Press because they have many great books available and generally speaking, I highly recommend them. I also don’t mean any offense to Andrew Huang, who I’m sure is a perfectly nice guy. I’m not sure who’s responsible for the inclusion of the Edward Snowden review and quote on the dust jacket, but that was a poor decision. Recommendation: If you like historical nonfiction and want to read about how someone else did it, read Huang’s blog and save your money.